Manufacturer of a wide range of products which include hdpe & bopp handle bags. We are a well-known manufacturer and exporter of HDPE and BOPP bags with handles. We offer HDPE & BOPP Handle Bags. These bags are fabricated with attention to ease of carrying. The design of these bags focuses on offering comfort to carry. 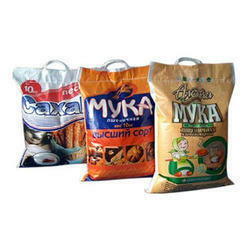 Made from best quality material, our bags with handles have a high strength and are ideal for small bulk packaging of various products. The bags are convenient to use and provide perfect protection from external factors to the products packed.